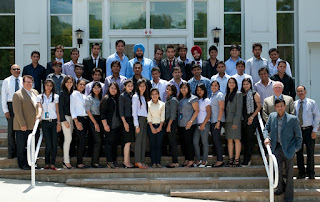 Jalandhar: Sixteen enthusiastic LPU students got great opportunity when they proceeded on six weeks’ visit to prestigious Hiram College (Ohio, USA). Highlighting, Hiram College has given illustrious alumni to the world and United States’ 20th President James A. Garfield as one of its most famous alumni. The visiting students will get innovative and inclusive global training in management & leadership by getting engaged with world-class faculty with extensive research and Industry backgrounds. B Tech students will get trained in ‘IT and Operation Management’, whereas MBA students in ‘Financial & MNCs Management’. Students will go through individual and small group projects, presentations & management workshops. Tours to Case Western Reserve, Cleveland State and Kent State Universities will let students observe and imbibe multi-cultural working environment. Great industry leaders at General Motors, Arcelor Mittal Steel, NASA, other professionals and recruiters will make students more pragmatic in approach through interactive sessions. In addition, they will enjoy sightseeing and Cultural trips to Niagara Falls and Pittsburg. Included in first 200 universities, Hiram College (OHIO, USA) has a proud tradition of educational innovation and excellence. With heritage of over 150 years, it is known for its study programmes & extra-curricular courses. It has the best campus and environment to conduct summer courses for international students. Its alumni are at top positions all over USA with rare distinction. Illustrative, LPU through its unique international exposure program in MBA, B.Tech and BBA organizes international tours and visits to provide students great international exposure. The University has many global entrepreneurship programmes with training/ Internship in Europe, Latin America, Africa and Asia. Through these, students get equipped with required global exposure through deep insight into latest trends and practices. Getting training from academic and industrial visits abroad, students learn culture of diverse clients, business practices and managerial skills, in a global context. They imbibe understanding and tolerance of others' cultures by broadening their social horizons. You should write great essays if you want to be a leader. On this useful source I found great writing advices.